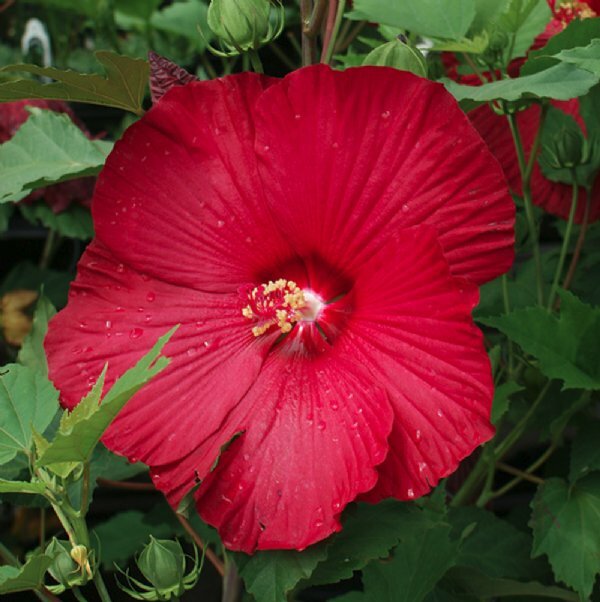 The 'Cinnamon Grappa' Hardy Hibiscus plant produces large dinner-plate sized, plush-red flower blossoms. It flowers in late summer (July-September) on plants with deeply cut, maple-like, bronze leaves that have green and purple accents. Cinnamon Grappa (Rose mallow) comes from the Cordial Series of hibiscus plants. They are know for being very sturdy and well-branched. They are very slow to break dormancy in the spring. All our 'Cinnamon Grappa' Hardy Hibiscus Plants are grown and shipped in fine quality growing medium. They are guaranteed to arrive alive and ready to plant. Comment: Hibiscus are my passion and this product is great,service is great and the people are great.Thank you so much. Comment: Good sized plant for 2.5 inch container. Arrived in perfect condition. Comment: Both Hibiscus arrived in good condition and once planted only took two months to grow large enough to bloom. The blooms are beautiful and the flowers look exactly as described on the site. Will use GrowJoy again in the future.